For water sports fanatics, the long, sandy Levante beach is just 650 metres down the avenue and all around there are bars, cafes and restaurants. Diehard shoppers will find enough to keep them happy in the area, but regular buses stop just 2 minutes from the apartments. Good location for all the nightlife but far enough away to not be annoyed by noise. Collected keys from the office next door to the entrance. Staff very friendly. Excellent breakfast in Mad Munk at the entrance to the apartments. Good food at Gallowgate across the road. The Benidorm market on Sundays and Wednesdays is at the end of the road. Swimming pool was closed and not many sun beds around but the beach was only a ten minute walk away. 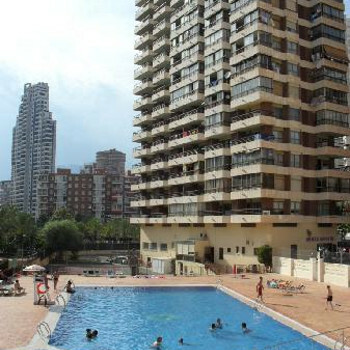 Hotel tip: We were on the 17th floor and had a great view of most of Benidorm. We also looked down on hotel Sol Pelicanos' swimming pool where they film "Benidorm". We stayed here for 1 week from 13 - 20th March. I was a bit worried as there were a lot of reports about the place been run down, to basic, unclean, lifts not working etc but let me be honest with you, there was nothing at all wrong with the place, and we had the 13th floor. On the odd day 1 of the lifts wasn't working but there were 2 others. The most we waited was about 2 mins while the lift came from the top floor. What made me laugh was people on the 1st and 2nd floor complaining about the time it took the lift to get to the ground. They could have walked by the time they waited! We had the studio apartment which consisted of a pull out bed in the living room. The only think it did lack was a microwave but here was a small grill oven. There was a cleaning deposit of 100e and we had to collect our keys at another hotel as we arrived out of hours but it wasn't a hassle. The person from the bar across the road looked after our cases and we got a taxi. It only took about 10 mins and cost 6e and that was with the taxi waiting. We had to check out at 10 the next day but we weren’t leaving until 6 so we were able to put our cases in the hotel garage. In all a cheap and cheerful holiday. I would definitely go back to these apartments and would recommend these to anyone. Cheap and clean thats all I can say but would not go back if it was free. 100 euro deposit and you dont get it back till your home they send it through a postal order now which is not on. We had just over 2 weeks there. It was absolutely brilliant. Everybody was very helpful. Rooms nice and clean, clean towels and bedding twice a week, handy location, lovely view (20th. Floor). We got far more than we expected for the money we paid. We were very pleased indeed and will definitely go again. We travelled with a family party although we booked separately. We had asked to near the others but they were on the 2nd & 3rd floors & we were on the 19th so the apartment reception ignored that request. We also had to pay £40 or 60 euro deposit even though we were told that no deposit was due, another mistake by reception, and because our flight was early on the Saturday we couldn't get our money back then, fortunately a family member still there can collect it for us. The apartment itself was fine, basic but clean. Fairly quiet except for the live outdoor entertainment from the nearby hotel which doesn't stop until midnight (later on Friday night), ok for us as our kids are 9 & 11 but might be a problem with younger children trying to sleep. Pool was freezing and loungers cost 2 euros each per day. You can't take any food or drink to the pool area, you have to buy it from the cafe. Towels were changed mid-week but no clean linen. All in a cheap & cheerful option and we would go back. As 2 young females we were looking for a low costing basic apartments and that is what we got. As soon as we arrived we were impressed by the service of seguro reps as we were greeted in the airport and given the keys to our apartment (at 2am). We had to pay 60 euros deposit to cover any damage but we knew about this when we booked the holiday we got this money returned day of check out with no hassles. The room was clean, basic, but only had a large sofa bed that separated to become 2 single beds, at first a hassle to make beds up each night but got used to this. Included in room was fridge, 2 oven rings, microwave/grill, toaster, kettle, pans, cutlery etc. We were on floor 17 daunting at first but well worth it views of Benidorm spectacular especially at night. There were Spanish people living in the apartments, but they were always friendly and talkative. We booked this with Prentice travel a cheap holiday for October. The apartment was a studio- but a large studio with cooking facilities and large south facing balcony. Basic inside but sufficient for our needs. Good area for easy access to beach and old town. STUDIO! Very basic but clean, no bedroom just a bed settee, you must leave a 100 euro deposit for any breakages and also pick up the keys from the main office next to the appartments. Didn't see many staff just the porter, you must hire sunbeds for 2 euros to use round the pool, which we never did, went to the Melias pool every day. No entertainment on site, next time if I used again would book a apartment which has a bedroom. Also no air con, but we bought a stand up fan for 20 euros, cheaper than hiring 1, for what we paid we couldn't complain.